It was the first nation in Latin America to establish a welfare state, maintained through relatively high taxes on industry, and developed a democratic tradition that earned it the sobriquet "The Switzerland of South America". But economic and political turmoil, in particular left-wing urban guerrilla attacks in the early 1970s, led the government of the day to suspend the constitution and launch a period of repressive military rule that lasted until 1985. Uruguay is still struggling to come to terms with the legacy of those years. Since the restoration of democratic government, successive governments have liberalised the economy. Colonial towns, beach resorts and a year-round mild climate have contributed to a growing tourist industry, and the economy has benefited from offshore banking. But a dependence on livestock and related exports has left Uruguay vulnerable to ups and downs in world commodity prices. 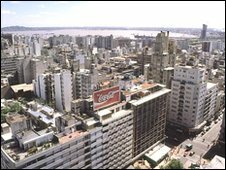 Recessions in Brazil and Argentina - its main export markets and sources of tourists - propelled the country into economic crisis in 2002. Payouts from the International Monetary Fund (IMF) and a restructuring of foreign debt encouraged a fragile recovery. But the recession left many Uruguayans living in poverty and prompted thousands of younger people to leave. Most Uruguayans are of European origin - chiefly Spanish and Italian. The country has a large middle class and is largely free of serious income inequality. But the minority who are of African or mixed European-indigenous descent form a higher proportion of its poorest people. In the 19th century Uruguay's newly-won independence was followed by a prolonged and ruinous conflict between two political factions - the land-owning Blancos (whites) and the urban Colorados (reds). 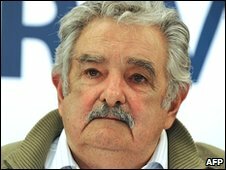 Former leftist guerrilla Jose Mujica took up office on 1 March 2010, after having won a run-off election against conservative former President Luis Lacalle in November 2009 with about 53% of the vote. Like his predecessor, Tabare Vazquez, Mr Mujica belongs to the left-wing Broad Front (Frente Amplio) coalition, and promised to continue President Vazquez's policies. He was a co-founder of the left-wing Tupamaros urban guerrilla movement during the 1960s, and was imprisoned during the 1973-1985 military dictatorship. Mr Mujica played a key role in transforming the Tupamaros group into a legitimate political party. Though he is popular with working-class Uruguayans, his rebel background alarmed conservatives, and while running for the presidency he was at pains to stress that he had left his militant past behind. On being inaugurated as president, he said it was important to look to the future, and insisted that he bore no grudge against Uruguay's armed forces. Mr Mujica is known for his informal and plain-speaking style, and has said that he models himself on Brazilian President Lula Luiz Inacio Lula da Silva, a left-leaning former trade unionist known for a centrist approach. The president's victory was seen as largely the result of his predecessor's popularity and the economic growth Uruguay enjoyed during President Vazquez's four-year term. Mr Vazquez was barred from standing for a second term. Uruguayans can access a wide range of views via more than 100 private newspapers, more than 100 radio stations and some 20 TV channels. Cable TV is widely available. State-run radio and TV are operated by the official broadcasting service, SODRE. Some newspapers are owned by, or linked to, the main political parties. Rights body Reporters Without Borders said in 2010 that Uruguay "stands out as an exception on a continent with a very marked media polarisation". More than 1.8 million Uruguayans are online (Internetworldstats.com, March 2011).